Applying to Columbia University dental school is simple, getting accepted is the hard part! With almost two and a half thousand applicants for just 80 places, the chances of being selected are very low. This is why most prospective dentists end up applying to so many dental schools around the country. If you want to be accepted by Columbia dental school admissions then you need to ensure that you have all of the requirements covered for application as well as understanding the process to apply. Dual Degree program – Columbia University dental school runs a collaborative program with Columbia’s Mailman School of Public Health issuing dual degrees covering public health and dental medicine. DDS/MPH – DDS/MPH from Columbia dental school equips students with training in dental leadership and healthcare delivery systems. DDS/MBA – The degree involves training students to develop managerial, dental and healthcare delivery skills in partnership with the Columbia Business School. DDS/MA – Students receive the award of degrees in science as well as education at Masters and a professional degree in dentistry. Global Programs – The program help students build extensive knowledge and care for global health problems across the world. It creates participation in Global Health Externship Program (GHE). Other Columbia University dental school health programs include the IFAP, ICAP. Columbia dental school prefers all students to have a very broad education that covers the humanities as well as science. They have some very specific requirements for subjects that must be covered during your studies. While they do not require you to have completed your bachelors’ degree preference is given to those candidates who have done so. They expect academic excellence from their students, the average GPA of successful students in the last year was 3.6. You must also have taken your Dental Admissions Test (DAT) within the last 2 years. You are able to take this test a maximum of three times in various centers around the country; the Columbia dental school will accept the highest score of your three tests. The average DAT score of those applicants accepted in the last year was 23 which is one of the highest in the country. DAT scores – The Dental Admission Test (DAT) scores is a must for applicants seeking admission into Columbia University Dental School. The scores should be submitted via AADSAS and not by the candidate unofficially. Letters of recommendation – Each applicant must submit three letters of recommendation written by his or her science professor. Alternatively, a composite letter should be submitted directly to AADSAS by the pre-health committee. Academic transcript – Applicants are expected to get copies of all their academic transcripts from schools attended sent directly to AADSAS for their Columbia Dental School application. Financial aid document – When applying for the Columbia dental school programs you need to pay an application fee of $75 plus show proof of eligibility to pay the institution’s fees. Whoever would be responsible for your tuition and more need to send a document showing proof of earnings and stating that their readiness. Personal statement/statement of purpose – You need an engaging statement of purpose and personal statement for Columbia dental school admissions. Your personal experience and goal for wanting to join Columbia University dental school must be explicit enough to secure an interview. If you are wishing to apply to Columbia University dental school then you should do so through the AADSAS which is the Association of Dental Schools Application Service. This is a service provided by the American Dental Education Association (ADEA) which allows all of your information to be collated online and then sent in a common format to the dental colleges that you choose. The AADSAS charges you for each college that you apply to and you can apply to as many as you want to. Columbia dental school admissions will receive all of your information from college transcripts through to your dental school personal statement directly through the AADSAS. Do not send information directly to the university as this could delay your application. Applications should be made from the start of June through to the end of December; the earlier you apply the more chance you have of success as they begin allocating places early. Get the best with your dental school personal statement today! Interview invitations into Columbia University dental school usually commence in August where applicants are sent invites in phases to attend the tour before the interview. By September the interview proper begins and will usually take place on Fridays as long as there is no public holiday on that Friday. The interview will run from September till February the next year at the College of Dental Medicine, Columbia University. Each applicant must monitor the AADSAS portal regularly for invites. Review all documents ahead – You need to go through your application documents before the interview. Also, have a clearer picture of your academic and work history, volunteer work and every other detail you need for Columbia dental school application interview. Research about the institution – You need to understand the entire application procedure for Columbia dental school admissions. Understand the features and training of the dental school, professors and how each relates to your goals for the Columbia dental school. You also need to note the specific questions you intend asking the committee because you should ask questions. Consistency – Whatever information contained in any of the document you submit must be consistent with the answers you provide to the Columbia dental school admissions committee during the interview. Integrity – Honesty and sincerity are two important traits the Columbia University dental school admissions committee would also be interested in. a solid integrity will increase your chance of success at the interview. Lies and deceit are some of the fastest ways to losing an admission opportunity. Display confidence – Confidence, trustworthiness, reliability, and poise will help an applicant stand out during the Columbia University dental school interview. But be careful not to appear arrogant or attempting to make up a good face by exaggerating. Organization – You need to arrive early, have adequate finance for lodging, feeding, tours, and more. Also, get all materials ready and packed ahead of time as well as be at the venue early. When it becomes necessary to put in a Columbia dental school application there are so many things to do such that it might become a bit confusing or hectic for you alone. And that’s where you need our professional Columbia dental school admissions service help. When you work with our service what you get is an increased chance of securing an interview and admission into Columbia dental school with less stress. The most important part of your application is your personal statement for dental school; our writers are highly educated and experienced and can write you a statement that will not only grab the attention of the committee but will clearly spell out your commitment to dentistry. Our writers’ knowledge of each dental school also enables them to tailor statements for the very best effect. So if you want to gain an advantage over your competition contact us today. 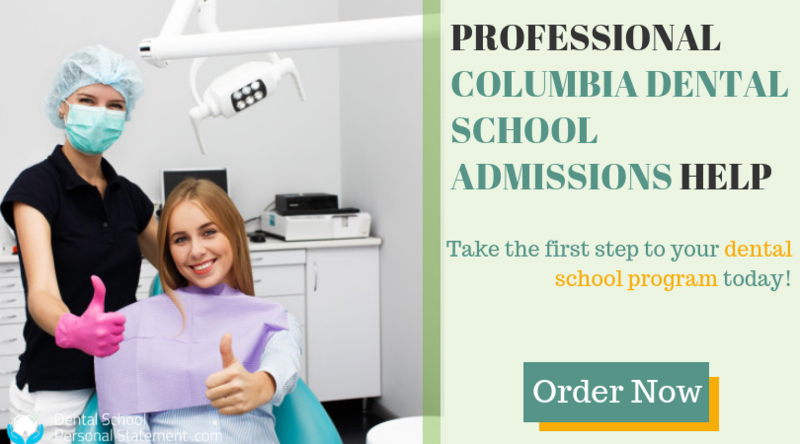 Contact us now and get the best help with your Columbia dental school admissions today!